I missed the greatest deal in the history of local Kijiji by 2 hours (meaning I called 2 hours after the ad was posted and was told later in the day that all items were sold to the first caller). Love the note in the ad "Price is negotiable"
Bought a fully functional F58 with broken shoe but otherwise in suberb condition for slightly under $100. Cost about $29 to replace the shoe. Won another heap of junk here on ebay. Paid £22.20. It looked like buried in that jumble was a small Minolta prime and perhaps a couple of Pentax lenses. Well we collected and I have had an initial look through. The Minolta 50/1.7 has a sticky iris but I should be able to get more than my money back on it. They go for lots here in the UK. But the pentax lenses turned out to be a 135/3.5 and a 50/1.4 Both SMC M42 and in excellent condition. Wow... Nice clean profit there. Some minor bits that should make a few bob but most of the cameras and the video cameras I fear I will have to dump as too much bulk and too little value. 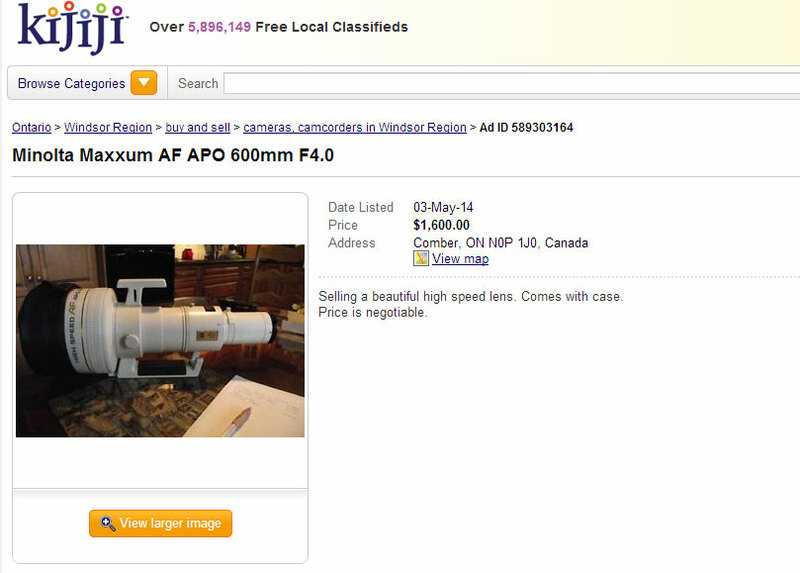 The 300mm is 2000CAD+tax and is not the HS version (plus the guy(s) is in Toronto area). Crap... a DEALER no less. I would have been SO much happier if it was at least just a regular bloke like us. Managed to pick up a SAL50 F1.4 over the weekend of £140 delivered. Haven't had a chance to test it yet but it looks in great condition, so pretty happy. Is that the one from Gumtree that he offered to sell to me for £130.00? No, I got it through the classifieds on Talk Photography. It could have been advertised on Gumtree as well, but I doubt it, as asking price for mine was £140, rather than £130. Yes, it's the same one @ £140.00, but he agreed to a £130.00 delivered price and never completed the transaction and I note it's now been withdrawn from Gumtree, so well done for scoring a heck of a deal. Excellent condition low shutter count SLT a55 with 18-55mm kit lens for $250 US.